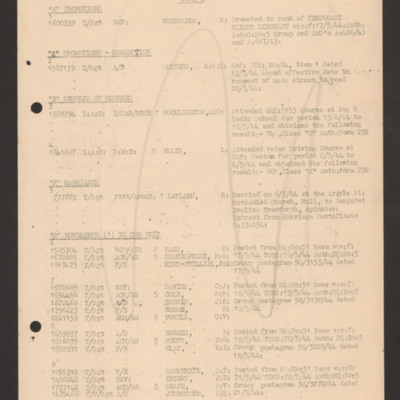 Temporal Coverage is exactly "1944-05-22"
List aircraft and crews for operations 21/22 May 1944. Includes duty personnel. Annotated 'Bombing, colours' and some pencilled notes. On the reverse handwritten notes on bombing method, route,timings, Window. Indicates four bomb loads, one of parachute mines for gardening and three for conventional bombs for bombing. Includes preselection settings, false height settings, window, route. Annotated 'Kiel bay, Duisberg'. Notes on the reverse. Shows single bomb load for squadron. Includes preselection settings, route, Window and notes on reverse. 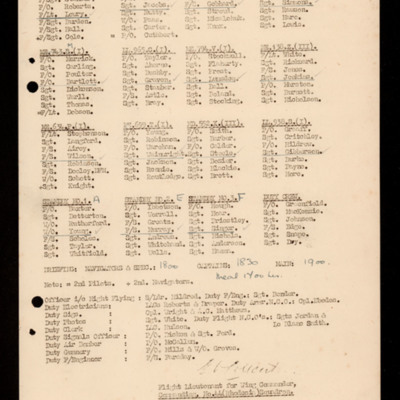 Lists crews and aircraft for operations 22/23 May 1944. Includes timings and duty personnel. Annotated 'Brunswick'.